Melanocytic nevi are frequently accompanied by inflammatory cells of different types, in varied amounts and distributed in different patterns. In the current report, we review the knowledge on inflammation seen in different types of melanocytic nevi. As an additional contribution, we studied the lymphocytic inflammatory component of Duperrat nevus, as well as the cytotoxic component of Sutton nevus, two contributions that we have not found in the literature. We conclude that: (a) Duperrat nevus has a mixed inflammatory reaction that includes histiocytes, foreign-body multinucleated giant cells, polymorphonuclears, lymphocytes (predominantly CD4+) and plasma cells (commonly abundant); (b) common melanocytic nevi with reactive inflammatory infiltrate usually show a CD4+ predominant population; (c) Meyerson nevus commonly shows an inflammatory infiltrate mainly made up of CD4+ T-cells; (d) Sutton nevus with halo phenomenon is accompanied by a dense inflammatory infiltrate with lymphocytes in a CD4:CD8 ratio varying from 1:1 to 1:3 and in which most of the CD8+ T-cells do not express cytotoxic markers; (e) Wiesner nevus commonly shows a spare lymphocytic infiltrate but the nature of the infiltrate has not yet been investigated. Hepatocellular carcinoma (HCC) represents a major health burden in the modern world. Because current treatment options for HCC are capable of providing good survival rates to only a limited number of patients, new therapeutic opportunities should be looked upon. The particularities of dendritic cells (DC) populations existing in the liver, and their consecutive selective activation of certain immunotolerant T-cell subgroups, account for the high success rate of allogeneic hepatic transplantation, currently the most efficient treatment for HCC. The particularities of dendritic cells (DCs) populations existing in the liver, and their consecutive selective activation of certain immunotolerant T-cell subgroups, account for the high success rate of allogeneic hepatic transplantation for HCC. These molecular mechanisms also open new paths towards cancer preventing and cancer curative vaccines, as well as successful immunotherapy. Our aim was to summarize the main aspects of the biology of DCs populations, especially those present in the liver, and to draw attention to their current and future roles in the curative treatment of hepatocarcinoma. Inflammatory bowel disease is a chronic disease, with unknown etiology, characterized by a sustained inflammatory cascade that gives rise to the release of mediators, capable of degrading and modifying bowel wall structure. The present study investigated changes of circulating metalloproteinases (MMP-3, MMP-9) and CRP levels in patients with ulcerative colitis and Crohn s disease, in order to contribute to the elucidation of pathogenesis. We have studied serum samples of 67 patients, of which 46 with ulcerative colitis (mean age 44.8 years) and 21 affected by Crohn s diseases (mean age 39.52 years), who were hospitalized in the Clinic of Gastroenterology of the Emergency County Hospital of Craiova, Romania. For the quantitative determination of MMP-3, MMP-9 and CRP, the ELISA technique was used. Both patients, with Crohn s disease and ulcerative colitis, showed increased production of studied immunomarkers, which were correlated with some clinical stages, indicating their involvement in the disease activity. Ureteral fibroepithelial polyps are a rather uncommon pathological entity. However, an increase of their incidence was recorded during the recent period, probably due to better access to the investigative methods. The aim of this study was to assess the diagnosis and endoscopic treatment particularities of these cases. Our experience was based on 11 cases evaluated in the last 12 years. The mean patients age was 43 years (between 26 and 54). Hematuria, flank pain, suprapubic discomfort and urinary frequency were the main symptoms. Diagnosis was based on ultrasonography, IVP (intravenous pyelography), cystoscopy and ureteroscopy and confirmed by histopathology. In four cases, smooth polypoid masses covered by apparently normal urothelium and protruding through the ureteral orifice were discovered. In six cases, the fibroepithelial polyps appeared as a large filling defect in the ureter. In another case, a large, organized, blood clot protruding from the left orifice imposed ureteroscopy with the identification of a mid-ureteral polyp. Ten cases were treated by ureteroscopic laser ablation, while transureteral resection was applied in one case. After complete excision of the polypoid base, a double-J stent was indwelled for six weeks. Histology described the lesions as fibroepithelial polyps: hyperplastic urothelium overlying an intact basement membrane with extensive submucosal edema, dilated blood vessels, chronic inflammatory cells and fibrous stroma. No recurrences were found during a follow-up period of 56 months (between 6 and 72 months). Ureteral fibroepithelial polyps represent a rare pathology, ureteroscopy being the gold standard diagnostic method. The appearance and location of the lesions are pathognomonic, and complete excision may be performed by ureteroscopic approach. Recurrences seem to be rare in these tumors. Liquid Based Cytology (LBC) has replaced Papanicolaou standard cytology due to its practical advantages. Our study aimed to analyze the diagnosis correlations and differences between the conventional and liquid based cytology. 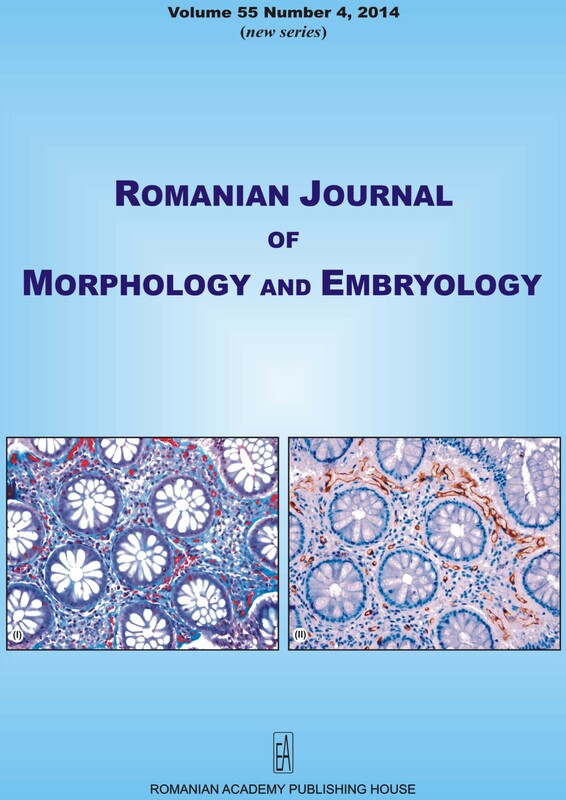 The study group has been composed by 104 patients, diagnosed in the Laboratory of Cytology, Galati County Hospital, Romania by using both methods on the same patients group. Our study revealed a good correlation between the results. Thus, in 78 from the total of 104 (75%) analyzed cases, the diagnoses established by conventional smears have been identical to that obtained in LBC. The diagnoses have been different in 26 (25%) cases, the inherent errors of conventional Pap diagnosis being corrected by LBC. LBC resulted in the diagnosis of some entities missed in conventional cytology, namely: ASC-US (atypical squamous cells of undetermined significance) (one case), ASC-US associated to AGC-NOS (atypical glandular cells not otherwise specified) (one case), and HSIL (high-grade squamous intraepithelial lesion) associated to AIS (adenocarcinoma in situ) (one case). LBC provided the identification of a higher number of cases of associated lesions, as LSIL (low-grade squamous intraepithelial lesion) and AGC-NOS (five versus two cases), and HSIL and AGC-NOS (seven versus five cases). The national experience is mainly based on conventional cytology usage, after Papanicolaou staining method. Extremely rare centers have benefited by the necessary infrastructure for LBC, thus there are no constant reports in the mainstream. The main impediments in large-scale application of this method, in all national screening centers are connected to costs for capital investments and by conditions of exploitation. Our experience and results support the simultaneous use of the two methods. Endometrial carcinoma is the most common malignancy in the female genital system and has increased in incidence during the past years. Our study was retrospective and included 79 patients with diagnosed endometrial adenocarcinoma. The parameters investigated in the study included clinical status, menopause, history of estrogen intake, obesity, histological results, transvaginal ultrasonography. We evaluated the status of the common clinicopathological features and immunohistochemical biomarkers of endometrial carcinoma. The main type of carcinoma was endometrial endometrioid carcinoma (68 cases), followed by serous carcinoma (seven cases). Immunohistochemical study performed included the following antibodies: cytokeratin, vimentin, ER, PR, PTEN, p53, beta-catenin, bcl-2, WT1 and Ki67. The immunohistochemical profile showed significant differences between the two subtypes. The majority of cases showed positivity for steroid hormones and the positivity correlated with the endometrioid subtype. We observed a correlation between p53 overexpression and specific histological alterations. A high percentage of Ki67 positivity tumors correlated with grade 3 tumors, as well as with a high percentage of p53 positivity. The study shows the importance of the use of biomarkers in the positive diagnosis and the guiding of therapeutic approach. Multipotent mesenchymal stromal cells (MMSCs) are plastic-adherent cells with a well-established phenotype. Equine, but not human, adipose MMSCs have been characterized ultrastructurally. The purpose of our study was to evaluate ultrastructurally the adipose-derived human MMSCs. Cell cultures were prepared from human lipoaspirate. The flow cytometry evaluation of surface markers of cultured cells confirmed the expected profile of MMSCs, that were positive for CD73, CD90 and CD105, and negative for CD34 and CD45. We examined these human adipose-derived MMSCs in transmission electron microscopy (TEM) by Epon en-face embedding the fixed MMSCs. The main ultrastructural features of MMSCs were the extremely rich content of endosomal/vesicular elements, long mitochondria, dilated RER (rough endoplasmic reticulum) cisternae, and abundant intermediate filaments and microtubules. We found two types of MMSCS prolongations: (a) thick processes, with opposite, vesicular and filaments-rich, sides and (b) slender processes (pseudopodes and filopodes), with occasional proximal dilated segments housing mitochondria, vesicles and secretory granules. These TEM features of MMSCs characterized an in vitro cell population and could use to distinguish between different cell types in culture. Dendritic cells (DC) are the most potent antigen-presenting cells, and induce antigen-specific immune responses. DC are believed to evolve into tumor-antigen pulsed cells and then to migrate to local lymph nodes, where they activate anti-tumor immune responses. This theory is supported by studies showing that high DC densities are associated with favorable prognosis in some tumor types. In the present study, we evaluated 40 primary and metastatic laryngeal carcinomas for the presence of DC, using immunohistochemistry with the anti-S100 protein antibody. We analyzed the relationship between the degree of infiltration by S100-positive (S100+) DC and prognostic factors, including histological subtype, histological grade, peritumor inflammatory infiltration, and stromal desmoplasia. The results show that in all evaluated laryngeal cancers S100-positive cells were significantly more frequent in the tumor stroma. Primary tumors with nodal metastases showed more significant differences in intraepithelial and stromal DC distribution than tumors without nodal metastases. A significant higher S100+ DC was also noticed in the desmoplasic stroma of lymph nodes. The subtype with keratinization had a significant higher S100-positive cells infiltration than the adenoid/transitional subtype. The infiltration rate of intraepithelial S100+ DC was much higher in well-differentiated (G1) tumors. No significant correlation between S100-positive cells and peritumoral inflammatory infiltration and stromal desmoplasia was found. In conclusion, dendritic cells need multiple, much more complex investigations. This work should be regarded as a preliminary investigation. The prognosis of laryngeal carcinoma patients can be improved by early diagnosis. The autofluorescence endoscopy has been developed to gain more information about the biologic character of the precancerous or cancerous lesions. The aim of the present study was to evaluate the diagnostic potential and limitations of this imaging technique applied during indirect laryngoscopy and comparing with white light and microlaryngoscopy with biopsy. In a prospective study, 56 patients with suspected precancerous or cancerous lesions were investigated preoperatively by white light and fluorescence endoscopy during indirect laryngoscopy. The procedure was followed by microlaryngoscopy and biopsy. Results were compared to histopathological findings. Normal laryngeal mucosa displayed a typical green fluorescence, moderate to high epithelial dysplasia, in situ carcinoma and cancer showed a diminished green fluorescence. In 47 of 56 (84%) cases, we found concordant results. The experience from this study shows that autofluorescence by indirect laryngoscopy may be a useful complementary method for detecting laryngeal malignancies. Its advantages are non-invasiveness, high sensitivity and repeatability. The pleomorphic adenoma, known also as mixed tumor of epithelioma with reshuffling stroma, is the most frequent salivary gland tumor, representing 45-75% of the total salivary gland tumors. In our study, we have investigated the immunohistochemical expression of E-cadherin and alpha-smooth muscle actin (alpha-SMA) in 15 cases of pleomorphic adenoma of salivary glands. We noticed the constant presence of E-cadherin reactivity at the level of luminal cells that cover the proliferative structures of ductal-cystic type, which gradually disappears to the periphery. At the level of epithelial proliferative solid areas, the reactivity for E-cadherin was inconstant and heterogeneous, while alpha-SMA expression increased. This aspect indicated the involving of epithelial-mesenchymal transition process in the evolution of pleomorphic adenoma. Aims: To investigate the circulating progenitor stem cells (cPCs) count evolution during seven days hospitalization period in ST segment elevation myocardial infarction (STEMI) patients, and to correlate their evolution with some clinical and angiographic parameters. Materials and Methods: Twelve Caucasian patients with STEMI undergoing primary percutaneous coronary intervention (PCI) were enrolled. Blood samples were obtained in the emergency room and then daily, for seven days, we evaluated the number of cPCs (CD34+CD45+, CD133+CD34+CD45+, KDR+CD34+CD45+ and KDR+CD133+CD34+CD45+) by flow cytometry using fluorochrome-marked specific monoclonal antibodies. Results: There is a statistically significant increase in cPCs counts in the following days after STEMI, with a different behavior depending on their phenotype. Mature cPCs (CD34+CD45dim, KDR+CD34+CD45dim) have two fairly similar peaks, first around the third day of evolution followed by a short decrease and a new raise in the seventh day, the more immature cPCs (CD133+CD34+CD45dim, KDR+CD133+CD34+CD45dim) have just one spike on the third day, and then almost disappear from the peripheral circulation. In a multivariate regression analysis, preprocedural TIMI (Thrombolysis In Myocardial Infarction) flow, postprocedural myocardial blush and LVEF (Left Ventricular Ejection Fraction) proved to be independent predictors for cPCs variation in the first week after STEMI. Conclusions: In our study, we demonstrated that all four main phenotypes of circulating progenitor stem cells boosted up in the next days after STEMI, with different patterns depending on cell type; preprocedural TIMI flow, postprocedural myocardial blush and LVEF proved to be independent predictors for cPCs mobilization in the first days after STEMI. Chronic wounds represent an important burden on the healthcare system, requiring frequent hospitalizations and expensive treatments. It is now recognized that a primary factor contributing to a non-healing trajectory and a low therapeutic response is the biofilm infection. The purpose of this study was to identify the bacterial isolates collected from chronic skin wounds of hospitalized patients and to evaluate their antimicrobial susceptibility profiles, virulence factors, as well as the ability to develop biofilms in vitro. A number of 44 wound samples were collected from 39 patients. The isolated strains belonged to seven different microbial species, i.e. : Staphylococcus aureus (32 strains), followed by Pseudomonas aeruginosa (4), Escherichia coli (3), Klebsiella pneumoniae (2), Proteus mirabilis (1), Citrobacter freundii (1), group G beta-hemolytic streptococci (1). In comparison to the other isolates, P. aeruginosa strains exhibited the highest capacity to develop complex biofilm structures in vitro, followed by S. aureus, with insignificant differences between MRSA and non-methicillin resistant isolates. The Enterobacteriaceae strains expressed less virulent phenotypes, lower adherence to epithelial cells and biofilm forming capacity, but also significant resistance phenotypes with a potential of unfavorable epidemiological outcome. The isolation of MRSA, ESBL-producing microorganisms and multiple antibiotic resistant P. aeruginosa suggests the potential risk of nosocomial spread and the potential severe outcome in case of bacteremia and sepsis. This study represents an important step in elucidating the host-wound microbiome interaction, by describing various resistance and virulence threats of microorganisms colonizing and/or infecting the chronic wounds. However, in order to establish a statistical relevant correlation, larger studies are needed. Peritoneal dialysis (PD) limitation as renal replacement therapy is mostly due to peritonitis and complications. Formation and persistence of intra-abdominal loculations is often under-diagnosed. Encapsulated peritoneal sclerosis (EPS) is a life-threatening complication, but malnutrition, recurrent peritonitis and early membrane failure are insidious enemies that need to be emphasized. It is important to highlight the persistence of intra-abdominal fluid collection after clinical resolution of peritonitis in PD patients and to indicate a new medical management approach for an early diagnosis. During five years, we selected PD peritonitis cases followed by a six months interval free of infections. Ninety-seven subjects were followed at six months and one year after the first peritonitis. Tomography had been performed to patients presenting a positive inflammatory state without a specific infectious cause. Subjects presenting documented localized fluid collection (31 cases) were divided into: drug-treated group and those undergoing laparoscopy by a new surgery technique (seven patients); a comparison regarding the clinical state and biohumoral parameters was assessed in both groups. The prevalence of intra-abdominal loculation following an apparent resolved peritonitis was high (31.9%). The cases undergoing laparoscopy presented a better evolution - improved clinical status (p=0.001), higher hemoglobin values (p=0.06), significant lower doses of erythropoietin requirement (p=0.03), improved dialysis adequacy (p=0.005) and inflammatory state. In cases with confirmed fluid encapsulated loculation, an active attitude (screening imaging protocol and laparoscopic exploration) appears to be mandatory, decreasing the risk of EPS, a serious complication which pathology and treatment are incompletely understood. Gait is a motor activity that requires understanding the dynamics and functional anatomical elements that make possible its cyclical conduct. Patients with multiple sclerosis record impaired balance and gait due to the process of demyelination, disorders that can be estimated by quantifying neuromuscular and cortical parameters. The aim of this paper is to present both an analysis of these parameters in the thigh muscles and an evaluation of cortical parameters obtained by visual evoked potentials (VEP). Patients and Methods: The study was conducted on a group of 13 patients (mean age 38 years) with multiple sclerosis (MS), who had clinically detectable gait disturbance. Evaluation methods used were tensiomyography (TMG) and VEP, the monitored parameters were: contraction time (Tc), stance time (Ts), displacement (Dm), if TMG in the two muscle groups of the thigh (biceps femoris and right femoris), and if VEP the assessed waves were N75, P100, N135-145. Results: There were estimated the average values of latency and duration of the three analyzed waves in VEP, the values of wave N135-145 were far higher than physiological values. In terms of TMG values, they results indicate the existence of a clear right-left functional asymmetry. Discussion and Conclusions: Analyzing these results, we note an increase in the muscular tone of the groups studied, a functional asymmetry agonist/antagonist, low speed response to stimulus. Regarding VEP wave parameters, we find significant variations of these waves latencies, particularly of P100 wave, while the duration of these waves did not register significant figures. In conclusion, we can emphasize a change in muscle structure with predominantly type I muscular fibers and inter-neuronal connections between areas of the association to substitute the lesions occurred in specific areas. Colorectal cancer is one of the most frequent malignancies with an increasing incidence and prevalence. As in other malignancies, nor etiology, neither pathogenesis of colorectal cancer are well known. The link between inflammation and colorectal cancer has become a major concern in the past 20 years, since several clinical trials have shown that patients with chronic inflammatory intestinal diseases have a much higher risk of colorectal neoplasm development. In our study, we analyzed peritumoral inflammatory reaction from histological and immunohistochemical point of view, in 23 cases of stage III colon adenocarcinoma, operated during 2014. The immunohistochemical techniques were used in order to emphasize B-lymphocytes, T-lymphocytes, macrophages, mast cells and blood vessels. In all cases, we have noted the involvement of inflammatory cells present in peritumoral and tumoral stroma, in variable degrees, regardless the differentiation of the neoplasm or other known histological feature. In particular, the macrophages were the most numerous, especially in areas of tumoral necrosis, but also present in the lumen of tumoral glands, or even within tumoral cell islands. Mast cells appeared more abundant in the tumor stroma around blood vessels and were absent in the areas of tumor necrosis, while B-cells were almost absent. Tumor stroma showed a well-developed vascular network, consisting mainly of small vessels that do not seem to correlate with the intensity of the inflammatory reaction. Basal cell carcinoma (BCC) is the most common skin cancer, may display various clinical aspects, frequently has subclinical extension, and through local invasion may induce important tissue damage. Reflectance confocal microscopy (RCM) is a modern technique that allows a non-invasive investigation of skin structure with a nearly histological resolution, and may achieve an optimal in vivo evaluation of skin tumors in combination with dermoscopy. We report a case of nodular BCC with areas of cystic degeneration in which in vivo RCM and dermoscopy evaluation enabled an accurate diagnosis and a detailed preoperative evaluation of tumor margins allowing the optimization of surgical treatment, with best aesthetic and functional results. Nowadays, giant ovarian mucinous cystadenomas are a rare condition, due to early diagnose and treatment. We report the case of a 44-year-old patient, who was diagnosed and admitted in our department with a giant pelvi-abdominal mass. The patient was operated with very high-risk consent, thus an enormous ovarian cyst of approximately 30 kg was extirpated. Afterwards, an extensive histopathological analysis was performed in order to determine the exact clinicopathological entity of the giant tumor-enteric type of multilocular mucinous ovarian cyst adenoma with borderline areas, with benign proliferation. Although giant ovarian mucinous cyst adenoma with borderline areas is an extremely rare condition, when encountered it is a real challenge for both surgeon and pathologist. The celiac trunk is the first unpaired midline branch of the abdominal aorta that usually gives rise to the left gastric artery (LGA), the common hepatic artery (CHA) and the splenic artery (SpA). Despite this classic arrangement, many variations exist. We describe an atypical case of an absent CT and anomalous origin of the LGA, CHA and the SpA from the abdominal aorta using multidetector computed tomography angiography (MDCTA) in a 72-year-old male patient. The LGA arose from the anterior wall of the AA at the level of the T12-L1 intervertebral disk [33.8 mm above the origin of the superior mesenteric artery (SMA)]. The SpA originated directly from the anterolateral wall of the AA at the junction of the upper-third and middle-third of the L1 vertebral body (24.8 mm above the origin of the SMA). The CHA branched directly from the anterior wall of the AA at the level of the middle-third of the L1 vertebral body (17 mm above the origin of the SMA). The 64-slice MDCTA system has become the primary tool for evaluation of abdominal blood vessels. It is important to be aware of such a variation as it can have a significant impact on surgical and clinical practice. Necrobiosis lipoidica (NL) is a rare dermatosis that has been shown to precede the onset of diabetes mellitus in 15% of patients. It is more common in women; the average age of the onset is 30 years. Skin lesions of classic NL begin as a small papule, typically on the bilateral pretibial area. Progressively, these papules become indurated plaques with an atrophic, yellow center and multiple telangiectatic vessels, and brown-violaceous borders. We present the case of a 57-year-old male with type II diabetes mellitus from 2004, class II obesity, hepatosteatosis and metabolic disturbances who presents a disseminated eruption from 2010, formed by indurated plaques with flattened centers and a tendency of atrophy and raised, sharply demarcated, red-violaceous borders, having a variable diameter between 1.5 and 5 cm. The laboratory findings revealed elevated glucose levels between 250 and 300 mg%, high levels of transaminases and lipids. Diagnosis of disseminated necrobiosis lipoidica granuloma annulare-type was histopathologically confirmed. For the treatment, we have used topical corticosteroids and Tacrolimus 0.1% and systemic vasodilators. We consider this rare case interesting because has some peculiarities, as: disseminated lesions extend over the characteristic areas for necrobiosis lipoidica, the characteristic features of lesions similar to granuloma annulare, gender (male) and the onset of the disease over fifth decade. We are presenting the case of a 19-day-old newborn with HIV-seropositive mother, under antiretroviral treatment since birth, who is admitted in the ICU (Intensive Care Unit) of the 1st Pediatric Clinic at the Emergency County University Hospital in Craiova, Romania, in critical general condition, with severe respiratory insufficiency. The examination of the tracheal and bronchial secretion revealed positive BK (bacillus of Koch). We considered it was an HIV/TB co-infection, the tuberculostatic treatment was instituted, but the evolution was towards exitus in the 11th day after admission. Multiple internal root resorption is a rare outcome of chronic irreversible pulpitis. In some cases, a chronic apical periodontitis can be later on associated. Usually, the conventional intraoral radiograph is mandatory in diagnosis but only CBCT proved to detect the true location, shape and size of resorptive defect and, if present, a perforation generated by resorption extension through the canal wall. Unlike the intraoral radiograph, CBCT is also able to improve the management and the recall evaluation, demonstrating a higher accuracy and reliability. Disseminated tuberculosis with the involvement of brain, liver and gut is a rare disease in immunocompetent infant. Early diagnostic and instauration of anti-tuberculosis therapy is capital because the outcome is poor. Here, we report the case of an 11-month-old boy with disseminated tuberculosis of brain, liver abdominal lymph nodes, small bowel and lung, which presented with fever, generalized tonic-clonic seizure, hemodynamic instability and a history of recurrent respiratory tract infections. His father was diagnosed with active pulmonary tuberculosis six month ago and family members completed an anti-tuberculosis chemoprophylaxis regimen. Dermatofibrosarcoma protuberans (DFSP), a rare type of mesenchymal neoplasm, is defined by the WHO as a superficial sarcoma with low-grade malignancy that develops in the cutaneous and subcutaneous tissues. The purpose of this paper is to present a case of a giant DFSP, with post-traumatic onset in childhood and a very long evolution. Clinical data: 51-year-old Caucasian patient presents for 41 years a presternal neoplastic lesion, with onset at 10-year-old, few months after a strong trauma. The patient addressed for a clinic examination, secondary to a spontaneous hemorrhage of the lesion. The local examination reveals the presence of a red-purple polynodular neoplastic lesion of 180x110x30 mm, of firm consistency, adherent to the subcutaneous tissue, painless, with lateral extension at 8 o clock as an erythematous infiltrated atrophic plaque appearance. One of these nodular masses presents surface ulceration and areas of necrosis. The CT scan did not detect any infiltration into the pectoral muscle or loco-regional metastasis. Under general anesthesia a wide surgical excision with free macroscopic margins of 3 cm was performed. Histopathological diagnosis was DFSP, with evidence of tumoral spindle cells disposed in storiform pattern, embedding small adipocyte panicles, creating a lace-like or honeycomb appearance. Immunohistochemically, the tumor cells express an intense and diffuse CD34 and they are negative for S-100 and SMA. The Ki-67 is focal positive in almost 2-4%. Clinical and paraclinical monitoring at 18 months follow-up does not detect any local recurrences or metastases, and an excellent quality of life. Solid pseudopapillary tumor of the pancreas or Gruber-Frantz tumor is a rare pathological entity. Its incidence is even lower in children. This neoplasm has low malignant potential and with adequate surgical treatment has a very good prognosis. We present the case of a 15-year-old girl admitted in our department for an intra-abdominal tumor, diagnosed incidentally on ultrasonography after a minor trauma. The CT scan revealed an important mass, apparently localized in the liver. Intraoperative assessment found the tumor originating from the pancreatic head (12 cm in diameter), well defined, with reddish-brown color, well-vascularized and heterogeneous consistency. It was completely removed without sacrificing other tissues. The postoperative evolution was uneventful. The microscopic feature of the tumor, using Hematoxylin and Eosin staining was characteristic. Immunohistochemistry confirmed the diagnosis. Four years postoperative follow-up showed no recurrence. Only several hundred solid pseudopapillary tumors of the pancreas are described in the literature. In children, the incidence of this tumor is extremely rare. Some investigators believe it is originated from pluripotent primordial stem cells. The clinical picture is non-specific. Despite its rarity, this type of tumor should be taken into account in the differential diagnosis of abdominal masses in children, especially in girls. The diagnosis is made only histologically. Complete surgical excision is curative. Noonan syndrome (NS) was described by Noonan and Ehmke as a multi-system disorder, which is typically evident at birth. The incidence of this syndrome is estimated to be one per 2500 to one per 1000 and affects both genders. While the clinical manifestations of NS have been well documented, the oral manifestations have not been extensively discussed. The purpose of the present article is to (a) review the oral manifestations of NS reported in the literature, and (b) describe four cases (three females and one male) of NS, who presented with short stature, cardiac problems and various oral findings. Based on these cases, we conclude that many oral anomalies may have possible relationships with NS, which require multidisciplinary treatment planning and timely management. The importance of oral findings in NS has largely gone unnoticed and it is essential to consider oral manifestations as scoring criteria in the diagnosis of NS. The ear is a complex organ that can be affected by various pathologies that are still fairly misunderstood. This work tests the possibilities of studying the ear and its pathologies using a virtual environment and thus bypassing expensive and time-consuming clinical trial. A previous validated finite element model of the middle ear was employed to study two pathological states of the middle ear. It was shown that the model obtained results very close to the clinical evaluation thus proving of being a proper tool for further investigations of middle ear pathologies. Conjunctival melanoma is a rare tumor, while malignant melanoma of the uveal tract is the most common primary intraocular tumor in adults. The authors highlighted the case of a 68-year-old male patient presented in June 2011 in the Ophthalmology Clinic of the Emergency County Hospital of Craiova, Romania, accusing foreign body sensation and the appearance of a tumor in the lower fornix of his right eye. The patient was clinically and paraclinically investigated, and clinically diagnosed with de novo malignant melanoma. The tumor was surgically excised and the lower fornix reconstructed with oral mucosa self-graft. Histopathological diagnosis was de novo, invasive, ulcerated malignant melanoma of the conjunctiva. Ki-67 immunohistochemical staining was also performed. After surgery, the patient was sent to the Oncology Department for specific treatment. Despite the histological poor prognosis factors present in our patient, two years after surgery and chemotherapy, the patient had no clinical sign of local or distance recurrent disease. Continuous ophthalmologic and oncological surveillance is necessary. This is the report of a case of four upper incisors with multiple internal/external resorptions after a falling accident in the childhood and subsequent violation of the biologic width by incorrect individual coronal restorations. Endodontic orthograde retreatment was performed and mineral trioxide aggregate (MTA) was placed as apical plug and to repair the large internal resorption. In order to re-establish the biologic width, a controlled surgical crown-lengthening procedure was performed. The expression of matrix metalloproteinase (MMP)-9 in the gingival tissue was used as a biomarker for the presence of inflammation in the hypertrophied gingiva. The one-year control revealed the cessation of the resorptive activities and the stability of the periodontium. The choice for a conservative combined treatment was essential in maintaining the affected teeth in an esthetically challenging area. Lymphomatoid papulosis, part of the controversial group of cutaneous lymphoproliferative pseudolymphoma disorders, raises important clinical and histopathological problems. It is a chronic, recurrent, clinically characterized by popular necrotic lesions and papulo-pustular nodules, sometimes self-limiting and characterized by histopathological changes suggestive of cutaneous lymphoma (CD30-positive). Since its introduction, in 1968, the term lymphomatoid papulosis was subject to dispute in terms of classification in malignancies, premalignant or benign skin disease. We submit for consideration the case of a man with papulo-necrotic skin lesions evolving for about one year with post therapeutic remission and relapses, with histopathology of lymphomatoid papulosis. The evolution under systemic glucocorticoids has been favorable, with remission of skin lesions in about three months without relapses to date.